Hi. Firstly, things are back to normal around here. Literally. After all that I had to leave this blog on my original server since I now realize I am not half as tech-savvy as I imagined. I will have to get a third party involved to do all the heavy lifting. Apparently this is a fragile little site that requires some care in transport. As I look out my window now, I see sprouting buds on trees that weren’t there a few days ago. Spring is coming on full force. After realizing last year that the workroom’s window is a perfect spot to grow things, we’ve brought back a little greenery to that sunny spot. I’ve been wanting to buy this little potmaker from Lee Valley for ages. 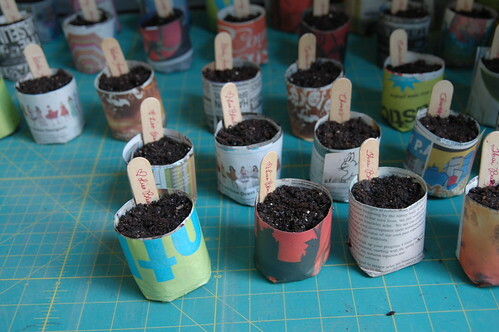 You use it to make little paper pots from recycled newspaper for your seedlings. Later on you can directly plant the pots into the ground and they will just decompose. 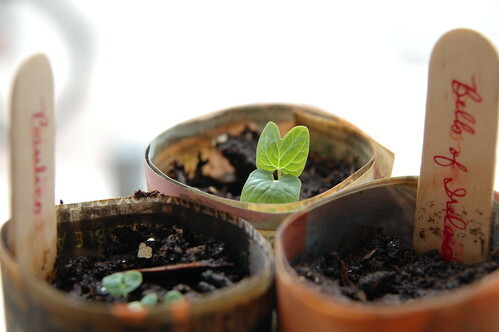 I spotted some clever recycled seedling pots at You Grow Girl the other day and was quite taken with them. The seeds are just a variety of flowers and herbs that I had in my seed collection, plus a packet of morning glory vines. I have fallen in love with flowery vines over the last few years and love the idea of them growing up and over everything. Once the weather is warm enough they will all be planted outside in the workroom’s backyard, which is about to undergo a transformation that will make it the scene for lots of outdoor fun this summer. Jerisse put the whole window installation together. Using stacks of our empty cardboard bolts from fabric to create different levels to place the seedlings on. 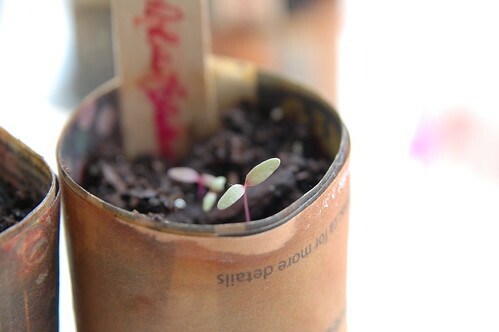 The seedlings finally started to sprout on the weekend after about week. I was starting to worry, but Mother Nature is pretty reliable. Amazing. This makes me wildly ashamed of my peat pot collection. What a great idea! Looks absolutely charming. These are beautiful in real life but I am so taken with the photos! lovely installation with a beautiful purpose karyn. I LOVE the potmaker! Great idea and I can’t wait to see what you do in the backyard. I love this window, Karyn…might be my favourite ever! 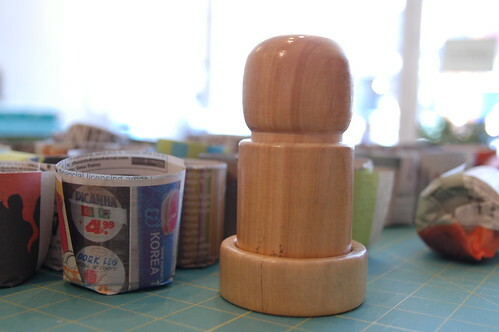 I love those little paper pots! What a wonderful idea! 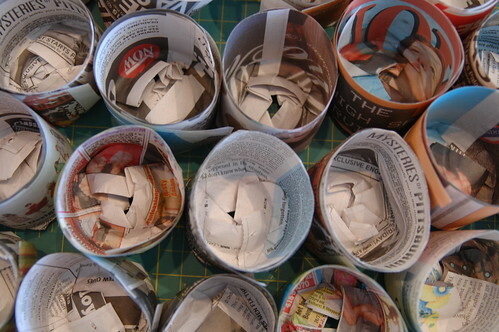 Such cute paper pots – thanks for the link to the potmaker product ^_^. Here’s hoping that your spring-summer gardening adventures get off to a great start! I hope you post more pictures of your botanical progress.